Check Out the Insane Trailer for ‘Cloud Atlas’ from the Creators of ‘The Matrix’!!! 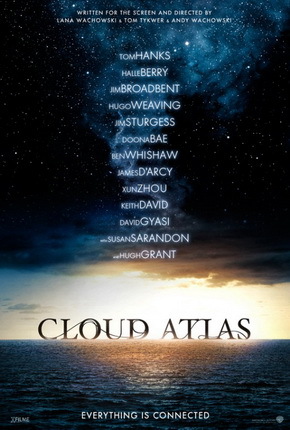 Here is a 6 minute trailer for ‘Cloud Atlas’. This definitely looks epic, which is based on David Mitchell’s magnificent story, which spans 100’s of years. Tom Hanks, Jim Broadbent, Halle Berry, Ben Whishaw, Jim Sturgess, Susan Sarandon, and Hugh Grant star. It looks like Tom Hanks plays several different characters and Hugh Grant looks like something out of Mel Gibson’s ‘Apocalypto’. The Wachowskis and Tom Tykwer directed this, which they brought us the ‘Matrix’ trilogy and ‘Speed Racer’. This opens October 26th. Below is an introduction by the Wachowskis and Tom Tykwer. This entry was posted on Tuesday, July 31st, 2012 at 9:34 am	and is filed under Film, News. You can follow any responses to this entry through the RSS 2.0 feed. You can skip to the end and leave a response. Pinging is currently not allowed. « Check Out the ‘Skyfall’ Trailer!!! 007 is Back!! !